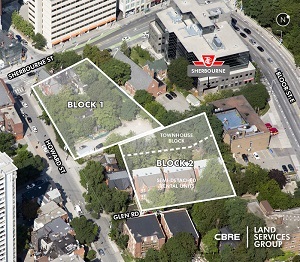 Concert Real Estate Corporation beat out 13 other bidders to acquire an approved residential mixed-use development site near the intersection of Toronto’s Sherbourne and Bloor Streets. “We were certainly willing to step up and be aggressive on the price,” said Concert president and chief executive officer Brian McCauley. He acknowledged paying a premium because zoning is already in place for his firm to redevelop the property. Concert purchased the site from a syndicate of developers and investors called Bloor Parliament Investments Limited in a deal brokered by CBRE. The Vancouver-based developer purchased the site — which encompasses 50,785 square feet and includes two adjacent blocks separated by Redrocket Lane — for $102.4 million. Block One is occupied by three vacant homes, but is zoned for a 50-storey mixed-use building with approximately 428,000 square feet of buildable gross floor area and a maximum of 477 residential units. The vacant homes will be restored. “I think there’s an opportunity to enhance the character of the architectural offering for the tower,” said McCauley. McCauley expects the condominium tower to include a mix of studios and one-bedroom, one-bedroom-plus-den, two-bedroom and three-bedroom suites. Block Two is occupied by six recently renovated, semi-detached units generating annual rental net operating income of $231,137. The block has approved zoning in place for seven additional three-storey townhouses with a maximum gross floor area of 13,455 square feet. The site is also zoned for approximately 11,000 square feet of retail and commercial space. McCauley said it could be dedicated to traditional retail, a restaurant or other creative uses. Concert’s goal is to submit a site plan application in the next six months, go to market in early 2019 and start construction later that year. * and other successful developments in the neighbourhood, including Tridel’s nearby Via Bloor condo, scheduled for occupancy in 2021. McCauley was also encouraged by the response to Concert’s 88 Scott Condominium Residences farther downtown. Located at Scott and Wellington Streets, at the intersection of the financial district and the St. Lawrence neighbourhood, 88 Scott houses 523 units in 58 storeys. Only five suites remain unsold. Concert, which is owned by union and management pension plans representing more than 200,000 Canadians, has undertaken developments worth more than $3.4 billion. It has developed nearly 12,000 rental and condo suites, and built or acquired more than 12 million square feet of income-producing properties. The company has a development pipeline with a cumulative 7,600 homes and 500,000 square feet of commercial space at six master-planned communities across the Greater Toronto Area (GTA), Metro Vancouver and Victoria. RioCan Real Estate Investment Trust (REI-UN-T) sold a 50 per cent stake in Sunnybrook Plaza, at the corner of Bayview and Eglinton Avenues, to Concert for $26.3 million last year. They’ll redevelop the site, which contained 50,766 square feet of retail space, into a mixed-use property that will feature 16- and 11-storey rental apartments as well as 43,000 square feet of retail. Concert has two other residential projects under construction in the GTA. The second phase of Sherwood at Huntington, a joint venture with Tridel at 1888 Bayview Ave. in the Lawrence Park neighbourhood, is being finished. It will have 80 luxury condo homes. The 28-storey, U31-designed The Kip District Tower One at 5365 Dundas St. W. in Etobicoke is sold-out and nearing completion. It’s the first of five new towers within a master-planned community at Kipling and Dundas that’s within easy walking distance of the Kipling subway station. “We’re in for site plan approvals for the second phase, which has twin towers,” said McCauley. “One of them is a condominium and one of them is rental.